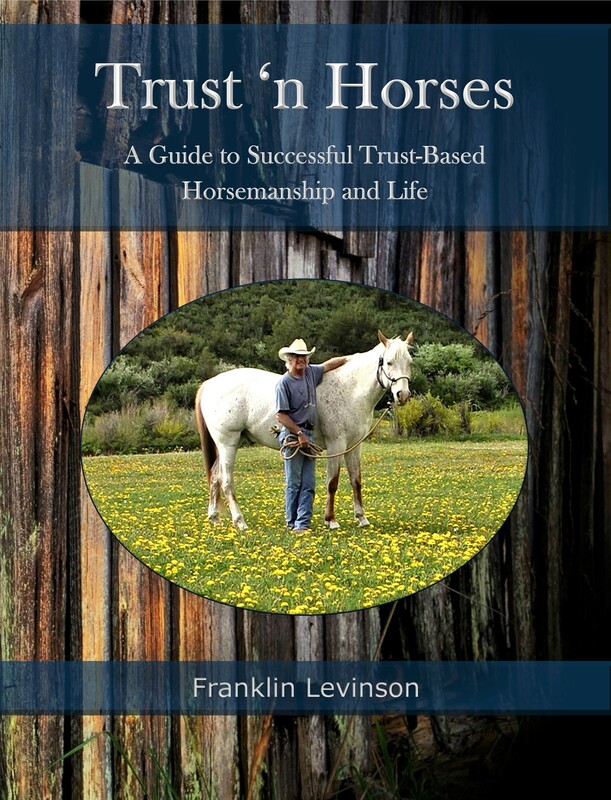 Franklin’s latest book TRUST ‘n HORSES is available now via this website. Order your copy now through this website and have it personally inscribed to you by Franklin. Overseas orders are welcome but will require additional postage. This book is also available worldwide though Amazon outlets, as well as Barnes and Noble Bookstores. Now available	for	your	Kindle	reader	from	Amazon. 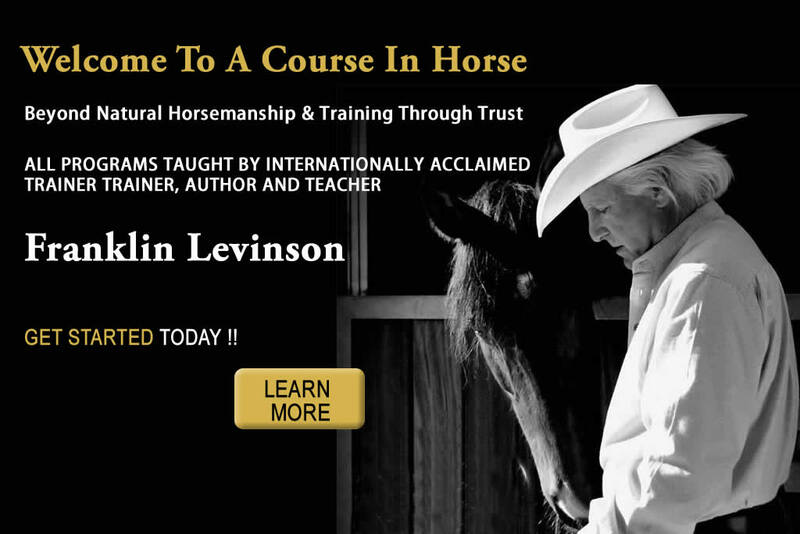 Beyond Natural Horsemanship with Franklin Levinson Long before the 'natural horsemanship' craze, horse trainer Franklin Levinson was teaching and training both horses and their owners using his own gentle, effective methods. 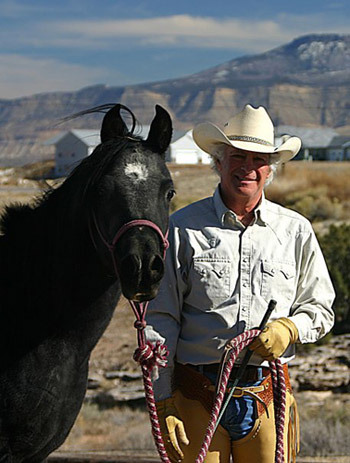 Now, with 40+ years experience as a professional horseman, Franklin is sharing his knowledge with groups and individuals around the world.. Franklin's Philosophy Showing humans how to have the best relationship possible with their horses and how to keep it has always been one of Franklin's main goals. To be good with horses at a high level requires us humans to come forward with our best qualities and attributes. Similar to a 'great parent', successful relationships with horses require compassion, kindness, precision, patience, clarity, real knowledge (not just opinions and projections), great leadership, acquired skills and more . Moreover, it is clear that practicing appropriate interaction with horses helps humans to become more highly functional in all their relationships. Thus, in all his programs, Franklin teaches success with horses as life enrichment for the human as well as the horse. I see that first clinic i ever went to of yours as a turning point in myself in both the way I am with the horses and in general life. So thank you do inspiring me to better myself and continuing to inspire me to learn and develop who I am and who I could be. Hi Franklin, just a note to say thank you for your article on physical space & emotions in horses. Reading it lead to one of the most powerful emotional moments I've ever had with a horse. We were playing hunt the jump on line in the paddock, she was learning to jump a single barrel & when she did it I'd stop sit on the barrel & tell her how clever she was. Instead of giving her a scratch or reaching into her space I let her come to me. She nuzzled my face & neck, we breathed together, snuggled in & let each other know how much we love each other. Sounds corny but it was so powerful, so beautiful I could have cried, lasted so long & I believe it's taken our relationship to a whole new level. I've only had this horse since September & without the knowledge you shared this magic time may not have happened. Now I'm out to find out what else you know that I can use to help me be the best I can for my horses. Cheers to more magic & to the wonderful wisdom you generously share!